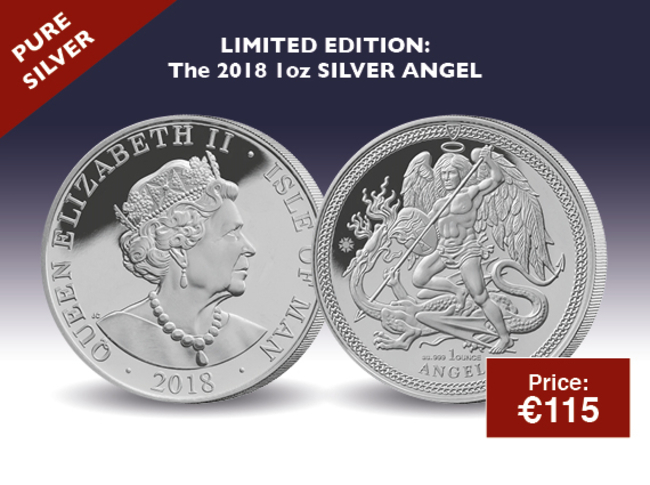 Rest assured that you have no further commitments and your purchase is protected by The Dublin Mint Office 14 day “no quibble” return guarantee. You have no further obligation. • The Company reserves the right to refuse to supply any individual or company. • All items shown are subject to availability and may be withdrawn at any time. • All prices shown are in Euros and include VAT where applicable at current rate. • No extra charge will be made for credit or debit card payments. • The Company will aim to deliver all goods within 28 days of acceptance of your order. If we are unable to deliver within 28 days, you will be offered substitute goods and/or a revised delivery date. Alternatively, you may cancel your order, in which case a full refund for any prepaid items will be provided. • Under the Distance Selling Regulations 2001, you have the legal right to cancel your order within fourteen working days starting the day after receipt of the goods. • A full refund will be issued on receipt of the returned goods for items previously paid, however we reserve the right to offset any other unpaid balances prior to processing your refund. • Customers should take all reasonable care with items while they are in their possession. • Legal and beneficial title to the goods shall remain with the Company until such time as the Company has received payment in full of the purchase price. Upon receipt of full payment title shall pass to the customer. In addition to your statutory rights, the Company provides a “no quibble” returns policy which allows you to return any goods (except personalised items), providing they are returned within 14 days of receipt, complete and in mint condition. Receipt of goods is determined to be the earlier of the date the delivery has been signed for or 7 working days from the invoice date. • The Company will provide customers with a pre-paid postage label which can be obtained by calling Customer Care on 1800 937 321. It is strongly recommended that you obtain and retain a certificate of postage for all returned items (provided free of charge by the Post Office). • In the event that a product is returned outside of the 14 day returns period, we reserve the right to refuse acceptance. Payments made by card, where supported by your card type (e.g. Visa MasterCard, Visa Debit, etc. ), by making a purchase under these terms and conditions you are granting continuous payment authority on your card. This will be used for your subscription payments. a) Charge interest on overdue invoices at a rate of 4% above the base rate of lending rate in force from time to time of the Governor and Company of the Bank of Ireland and accrued on a daily basis from the date payment became due to the date of receipt of cleared funds. b) Charge a late payment fee for overdue invoices plus an additional fee to cover expenses incurred in providing the buyer with written or verbal reminders, or for passing the overdue debt to a solicitor or authorised third party for legal proceedings or for tracing & collection. c) Charge a fee to cover the costs and administration incurred by the seller for processing unpaid cheques, direct debits, declined, refused, rejected or disputed card payments and for processing rejected or refused payments for other payment types not mentioned. d) Charge a fee for providing the buyer or an authorised third party for the retrieval, copying and despatch of copy invoices or statements. e) Suspend or cancel an application, order or account without notice. The Company offers a voucher policy for repurchased goods at the discretion of senior management. The vouchers will be a percentage of the noted value of the repurchase which must be redeemed within 12 months of the issue date unless an alternative agreement has been made. These vouchers will be limited to the purchase of comparable products as defined by the management team. A credit limit will be applied to your account at our sole discretion and subject to account approval in accordance with our internal credit policy. The Company complies with the conditions of the Data Protection Act and will only supply your details to contracted third party partners for processing purposes. The Dublin Mint Office Ltd follows the Guidelines of the Irish Direct Marketing Association and the Data Protection Acts of 1988 and 2003.
Credit or Debit Card: Please have your preferred card to hand and contact our customer care team on 1800 937 321 Monday - Friday between the hours of 09:00 - 17:30 with the exception of ROI bank holidays. A Customer Service representative will be available to process your payment and provide assistance should you have any questions. All cards with the exception of Diner Card and American Express. Internet & Telephone Banking: Is available through internet banking or telephone banking via your Bank or Building Society. For payment please quote The Dublin Mint Office Ltd Bank account with IBAN IE60 AIBK 9313 6514 5090 09 and SWIFT code AIBKIE2D. Please ensure you enter or quote the 10 digit Dublin Mint Office customer number beginning ‘70’ as the payment reference. The customer number can be found in the top right of the invoice or reminder letter. BillPay: For ease of payment, you can take your invoice(s) or reminder letters to your local Post Office and make cash or card payments using the remittance at the bottom. Cheque or Postal Money Order: Should be made payable to The Dublin Mint Office Ltd and sent to the freepost address shown on the front of the invoice or reminder letter, or in the enclosed business reply envelope. Please ensure you enclose the original remittance slip from the invoice(s) or reminder letter(s) you are making a payment for. To avoid processing delays, the reverse of the cheque or postal order should be endorsed with your name, address, invoice numbers and customer number. Like all other websites with online shopping facilities at www.dublinmintoffice.ie we collect personal information when you shop with us. Information that you provide by filling in forms on our site www.dublinmintoffice.ie. This includes information provided at the time of registering to use our site, subscribing to our newsletter, posting material or purchasing products. We may also ask you for information when you enter a competition or promotion sponsored by The Dublin Mint Office, and when you report a problem with our site. You have the right to ask us not to process your personal data for marketing purposes. We will usually inform you (before collecting your data) if we intend to use your data for such purposes or if we intend to disclose your information to any third party for such purposes. You can exercise your right to prevent such processing by checking certain boxes on the forms we use to collect your data. You can also exercise the right at any time by contacting us at customercare@dublinmintoffice.org. For further information about managing and disabling cookies on your computer see www.dataprotection.ie/docs/Cookies/1416.htm. We use a third-party service provider to advertise on our behalf across the Internet. When you visit our website because you have seen one of these ads, they may collect anonymous information about your visits to our Web site, and your interaction with our products and services. They may also use information about your visits to this and other Web sites to target advertisements for goods and services. This anonymous information is collected through the use of a pixel tag, which is industry standard technology used by most major web sites. No personally identifiable information is collected or used in this process. They do not know the name, phone number, address, email address, or any personally identifying information about the user. If you would like more information about this practice and to know your choices about not having this anonymous information used by our third-party service provider, please visit our third party service provider’s website. You can also read more about online marketing practices and the technologies that support them by visiting http://www.youronlinechoices.com/ie. An email is on its way! It has a magic link that will log you in.